Fordham Law will have a tremendous impact on your life, Khadijah Sharif-Drinkard ’97 recalls James McGough, director of financial aid, telling her when she was awarded her scholarship long before she stepped into her first 1L class. The message proved prescient, albeit earlier than she expected, when in her 3L year her mother’s cancer diagnosis necessitated Khadijah’s move from Jersey City back home to Harlem to care for her ailing parent and 6-year-old sister. Sharif-Drinkard routinely departed Fordham Law at 3 in the afternoon to pick up her sister from elementary school, dropped her sister off at home where she cared for her mother, and then returned to the Law School to focus on her three active cases for the litigation skills clinic in addition to working on the note she published in the Fordham Urban Law Journal, for which she served as an editor. Amid this challenging year, Sharif-Drinkard and then-new Professor Elizabeth Cooper—ever flexible and encouraging with her young pupil—bonded and developed a friendship that endures to this day. “Sometimes you give up a little bit to get a whole lot,” Sharif-Drinkard said of her mother’s triumph over cancer and the bonds that ordeal helped her forge at the Law School. “Thank God I went to Fordham and had the support of all the people here,” she added. The legal education, litigation training, and writing skills Sharif-Drinkard acquired at Fordham Law laid the foundation for an extraordinary entertainment law career that continues to scale new professional heights and earn accolades from her peers. In the closing weeks of 2018, mass media giant Viacom promoted Sharif-Drinkard to senior vice president of business and legal affairs, where she oversees business and legal affairs for one of its networks, ensuring the longtime executive an expanded role in producing impactful projects for larger audiences in the new year. Her professional excellence and willingness to champion younger lawyers also attracted substantial acclaim outside Viacom’s Times Square office in 2018. In May, the Muslim Bar Association of New York awarded Sharif-Drinkard its first Corporate Counsel Award in celebration of her advocacy, service, and leadership. Cooper was in attendance to see her protégé accept the award. Days after her new title became official, Sharif-Drinkard pointed out that ascendant career moves were not uncommon among her team at Viacom. In fact, its members received more promotions than her in recent years, she happily attested, emphasizing how serious she took her role in their career advancement, professional skills development, and mentoring. Additionally, Sharif-Drinkard is dedicated to developing a strong leadership pipeline that both mentors and sponsors young talent. This includes, but is not limited to, young Muslim lawyers; after all, a good Muslim serves all people, she noted. 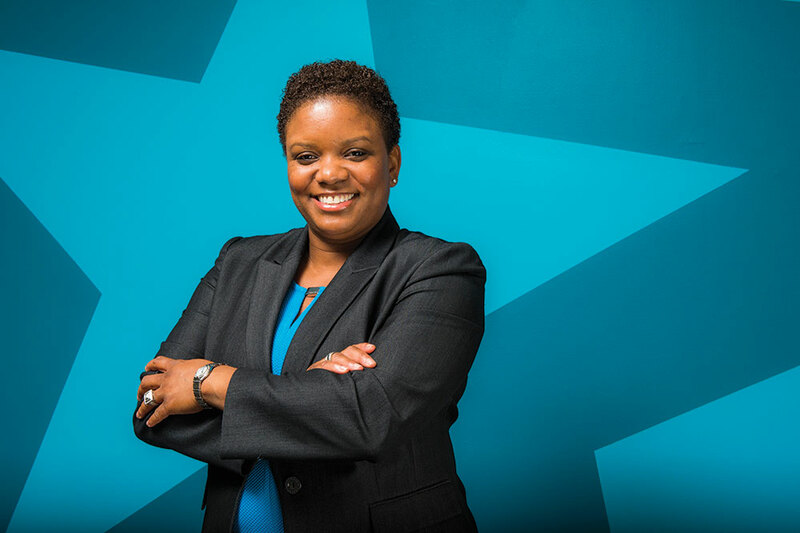 Sharif-Drinkard prides herself on bringing her entire, authentic self to the workplace. Over the years, she has excelled with this approach as vice president, associate general counsel for Viacom’s Black Entertainment Television (BET) and as vice president, senior counsel for Nickelodeon. The value she offers goes beyond just checking a legal advice box. Entertainment executives, many of whom are white men, have not historically made such inquiries. However, Sharif-Drinkard raises these questions in her day job and as president of the Black Entertainment and Sports Lawyers Association (BESLA). Sharif-Drinkard, who is serving her second one-year term in 2019, spends considerable amounts of time volunteering with BESLA to promote career growth for young black attorneys who have traditionally encountered closed doors in entertainment and media law. With an assist from Cooper, Sharif-Drinkard brought BESLA’s annual conference to Fordham Law, and along with it such luminaries as former NBA Commissioner David Stern, legendary music executive L.A. Reid, and then-BET Chairman and CEO Debra Lee. BESLA will convene its 2019 annual conference at Fordham Law on April 15. Sharif-Drinkard also returned to the Law School on Jan. 25 to moderate a panel during the Second Annual Women’s Leadership Institute: Celebrating 100 Years of Women. Within this synergy, Fordham Law’s impact on her becomes, in ways big and small, its impact on the world.